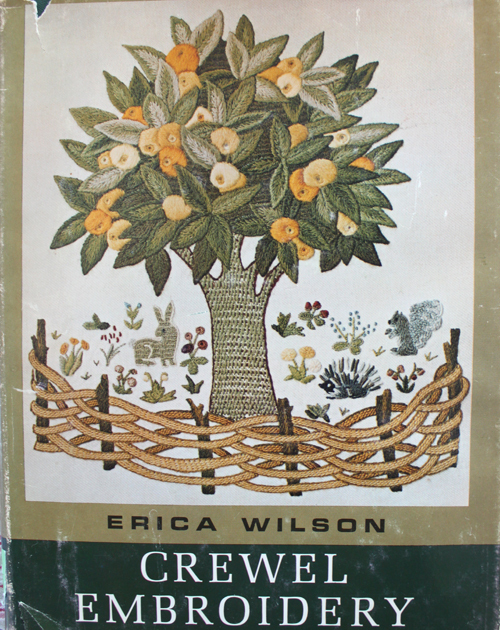 It's 50 years old, but it's easily the best book on crewel embroidery that I have seen so far. It's not a pattern book and only some of the pictures are color. But it doesn't matter, there is history, design ideas, stitch instructions, and lots of inspiration. She was a prolific embroiderer and designer. Her love of all things embroidery really shows through in both this book and her other Book of Embroidery. They are both worth owning. I found my copies on Amazon in the used books tab. The answer is they look great. (Ooops, just noticed that the bee is upside down!!) A little photo does not do them justice. They each have their own color and feeling but none of that is diminished when seen as a group. The wool makes it easy. Now I have a little birdie here sitting waiting to join the group. Better get busy!! Erica Wilson was a goddess. It's so nice to see another crewel enthusiast speak well of one of her books! Hope you enjoy your book Emily....loving your work. I think you're a very talented designer and I enjoy your blog. Erica Wilson sold her own designs in kits--maybe that's why she discouraged embroiderers from learning to draw and design their own work. I have one of her crewel designs that I embroidered over 30 years ago still hanging in my living room, and I'm ashamed to admit I have another one I started then and never finished!